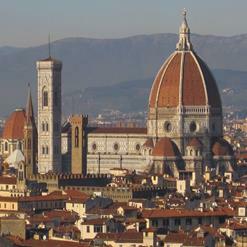 Also known as the Duomo di Firenze is the city's beautiful cathedral, the symbol of the city. Brunelleschi's huge dome was an engineering feat of the rennaissance. A statue of Brunelleschi is sited in the piazza, with his figure looking upwards towards his dome.